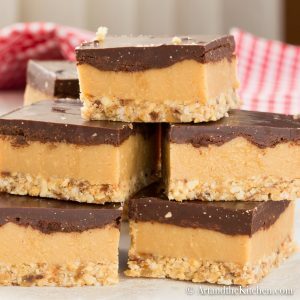 Healthy No Bake Peanut Butter Bars have 3 delicious layers with healthy ingredients such as coconut, dates and homemade peanut butter. 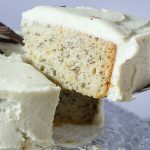 *I had the pleasure of developing this recipe using my new Ascent Series A2500 Vitamix blender. This is a sponsored post for Vitamix. All opinions expressed are my own. 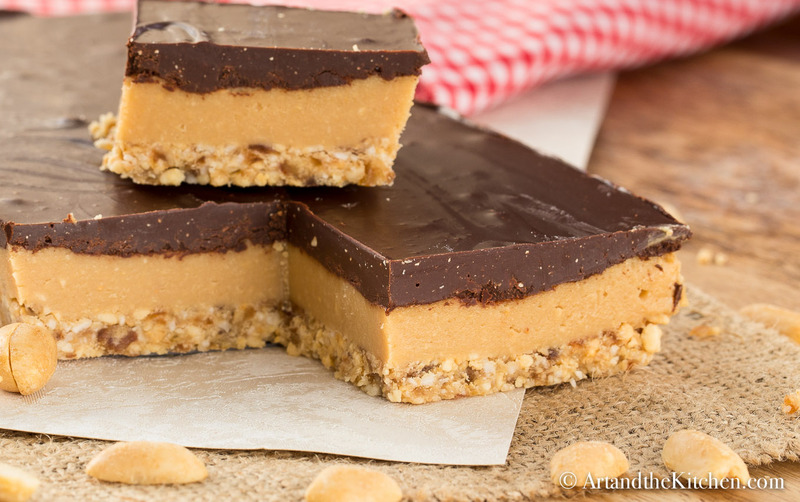 Healthy No Bake Peanut Butter Bars have 3 delicious layers. 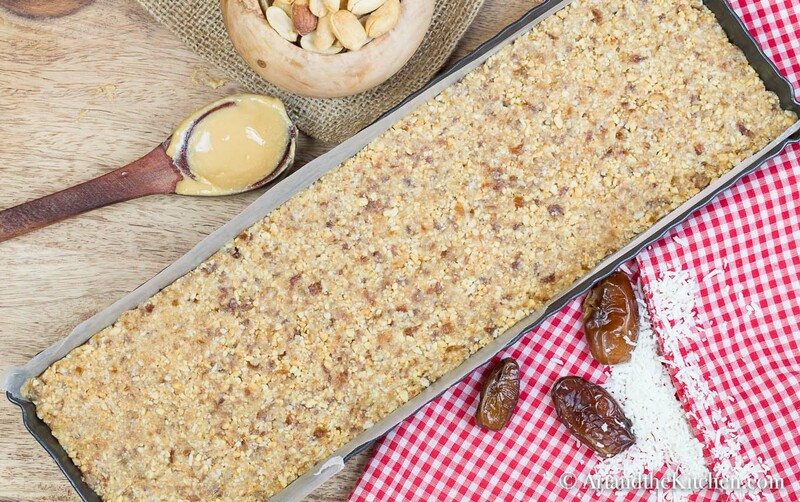 The crunchy crust is made with peanuts, shredded coconut and dates. The smooth creamy centre is a tasty combination of fresh homemade peanut butter, organic coconut oil and pure maple syrup. 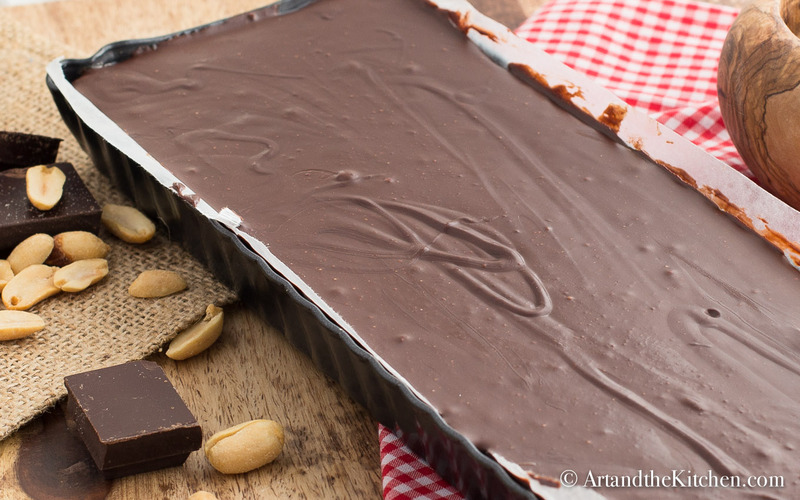 The bars are then topped with healthy dark chocolate. 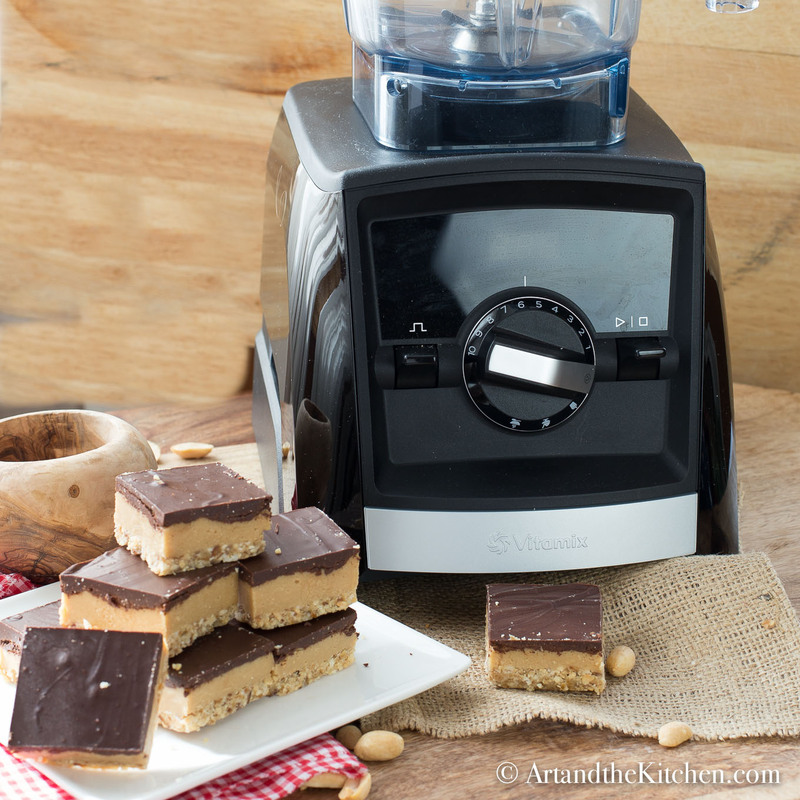 Making these peanut butter bars was so easy using my new Ascent Series A2500 blender from Vitamix. My Vitamix blender allowed for total control over the consistency of both the homemade peanut butter and the crumb crust. 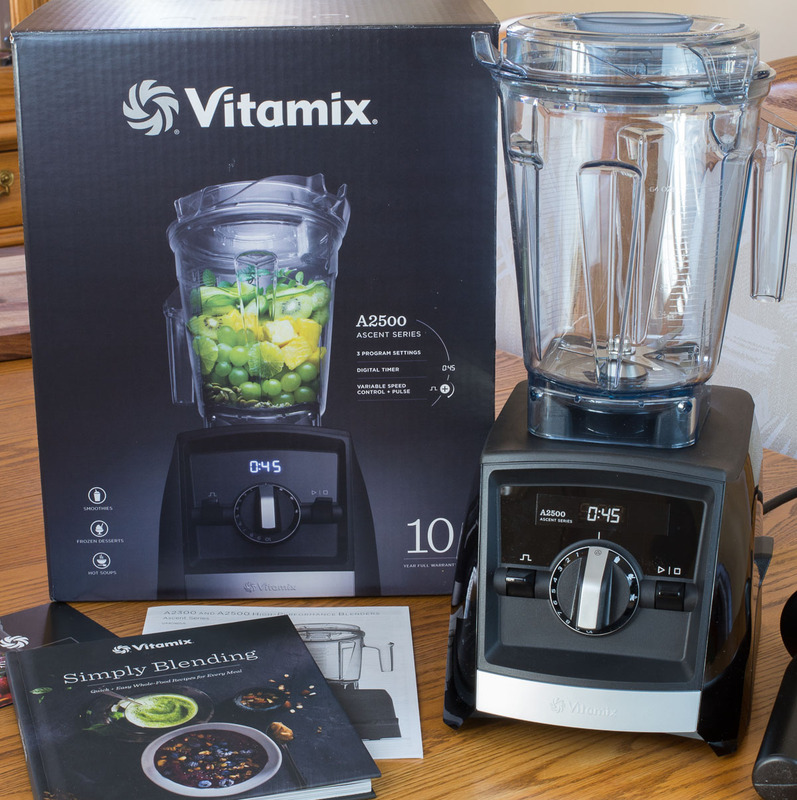 The A2500 Ascent Series blender from Vitamix is the ultimate multitasking kitchen appliance and I’ve enjoyed making everything from hot soups to cool and refreshing smoothies in it! 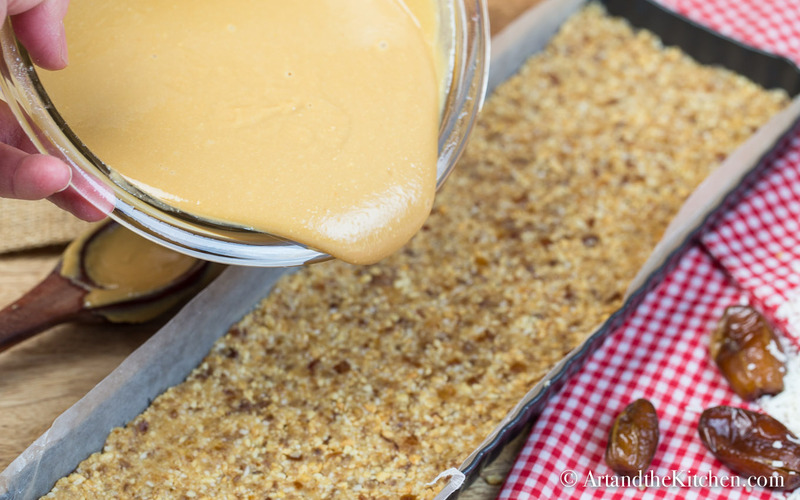 The first step in making these gluten free, dairy free peanut butter bars was making homemade peanut butter. I followed the instructions from Vitamix Peanut Butter Recipe but used 4 cups of dry roasted peanuts instead of 3 cups. 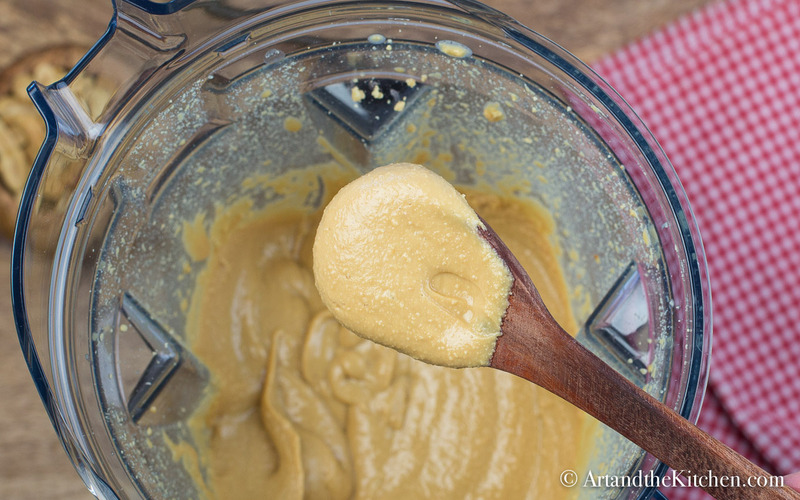 After making the peanut butter there is no need wash the blender, just use a rubber spatula to get most of the peanut butter out and then wipe out with a paper towel. 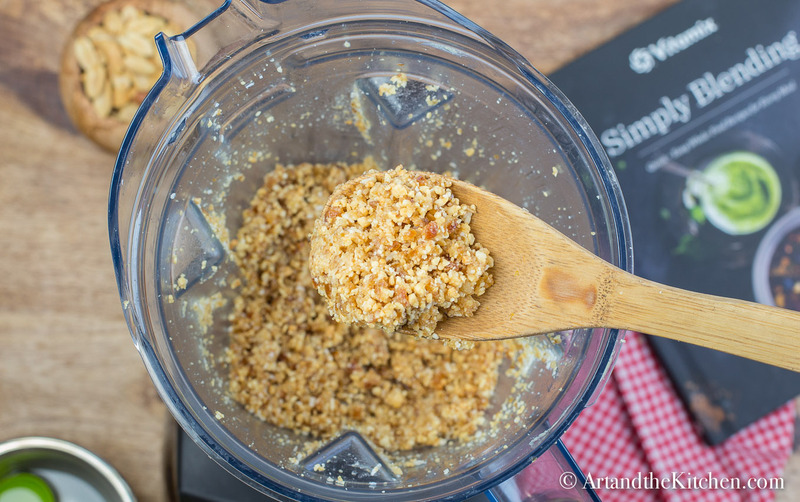 Next, place peanuts, dates, shredded coconut and coconut oil into blender and using the pulse mode blend to a crumbly consistency. Press firmly into a 4.5 x 14 inch non stick tart pan that has been lined with wax paper. The centre layer is made with smooth and creamy homemade peanut butter blended together with organic coconut oil and pure maple syrup. Refrigerate for at least one hour to allow peanut butter layer to set and then top with melted dark chocolate. 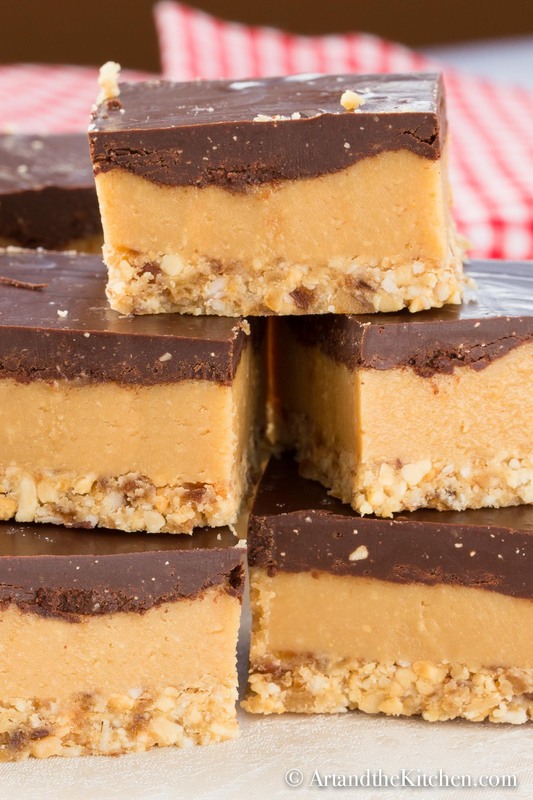 These bars must be kept refrigerated as there are no additives or preservatives in the homemade peanut butter! Place dry roasted peanuts, shredded coconut, dates and 2 tablespoons coconut oil in Vitamix blender and using pulse mode blend until combined and coarsely ground. Mixture will stick together when pressed between fingers. 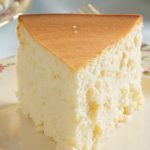 Don't over-blend or you will have mush! Press firmly into 4.5 x 14 inch tart pan that has been lined with wax paper. 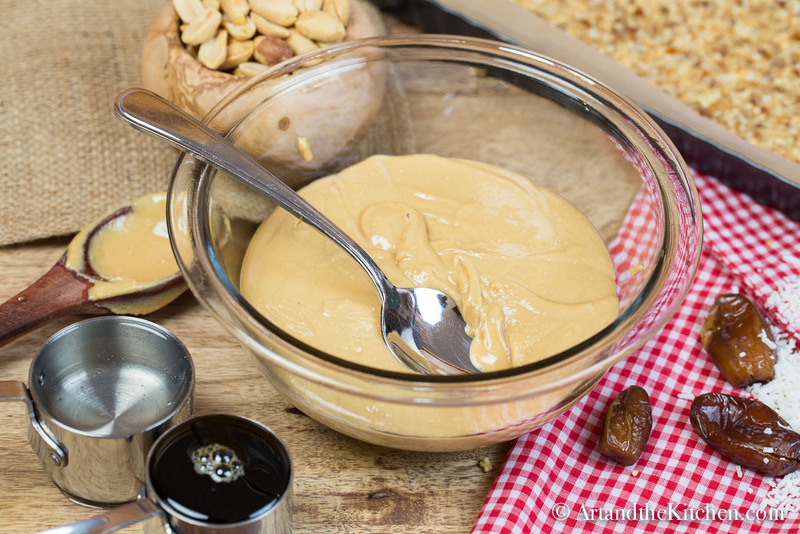 In medium size bowl, stir together homemade peanut butter, 1/3 cup coconut oil and maple syrup. Pour over crust and spread evenly. 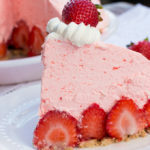 Place in refrigerator for about 1 hour to allow to set before adding chocolate layer. For chocolate layer melt 8 oz of dark chocolate in microwave at 50% power, stirring every 30 seconds until smooth. Stir 1/2 cup homemade peanut butter into the melted chocolate. Spread over peanut butter layer and refrigerate until set. 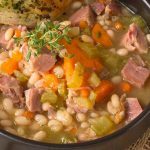 Store in refrigerator until ready to eat. As these bars are made with peanut butter that has no preservatives they must be kept in the refrigerator and served chilled! To make Homemade Peanut Butter place 4 cups dry roasted peanuts into Vitamix container and secure lid. Start machine and slowly increase speed to its highest speed. Use tamper to press ingredients towards the blade. In about 1 minute when butter begins to flow freely reduce speed to variable 7. Blend for about 30 more seconds until smooth. The Vitamix Ascent Series A2500 has set me on a culinary adventure developing new, creative recipes that are healthy, easy and great tasting! Not only does its sleek design look great its super powerful motor blends everything to perfection! 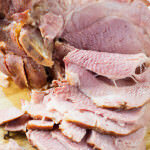 Pin this image to your favourite Pinterest Board! 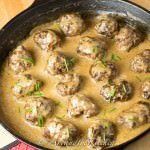 Love if you would take the time to follow me on Pinterest Facebook and Instagram where I post all my recipes.